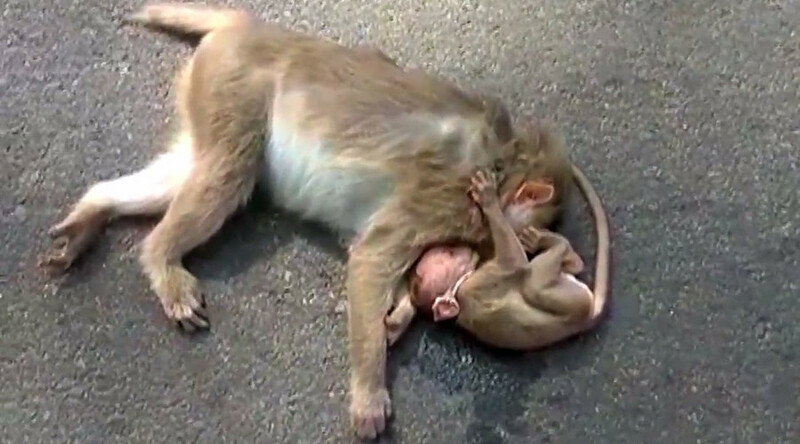 In a heart wrenching scene, a baby monkey wept inconsolably as it tightly held onto its dead mother’s body after she was killed in a road traffic accident in southern India. The monkey died after being struck by a vehicle while crossing the road near the village of Elanthoor in the state of Kerala. The baby monkey saw its mother being run over and rushed to where she lay on the road, according to local reports. Footage of the incident shows the baby mournfully trying to wake its mother, clutching her face and crying out in a scene that bears striking resemblances to human grief. “Losing a loved one will be painful not just for human beings,” a woman who witnessed the scene told the Times of India. “Animals too mourn. We saw the young monkey weeping over the carcass of its mother,” she said. Police reportedly separated the young monkey from its mother as villagers moved the carcass away from the road. The tiny monkey followed the crowd and watched from a distance as they cremated the mother’s body.